I had a whirlwind romance. I met my husband, proposed to him at 4 months and was married in Vegas by 6 six months. Being pragmatic, I only spent $35.99 on the wedding, you know, just in case it didn’t work out. He’s the peas to my carrots, the beat to my melody, and while I occasionally want to throttle him;it’s been a pretty magical 9 years. So, when reading this book I could draw some parallels because I am happily married with three children and couldn’t imagine (refuse to imagine) what could possibly pull us apart, and neither could Alice, the main character of the book. At a spin class, Alice falls off the bike, hits her head and when she awakes she loses all memories for the last 10 years of her life. She remembers her loving husband Nick and the fact that she’s expecting her first child…the only problem is? It’s 2008, not 1998, and she has a c-section scar and pictures of three children in her wallet. When she talks to Nick on the phone, it’s clear that they’re going through a bitter custody battle and divorce proceedings. Her shy mother is now happily in love and flourishing;while her once vibrant sister, is struggling with 7 years of infertility treatment and numerous miscarriages. 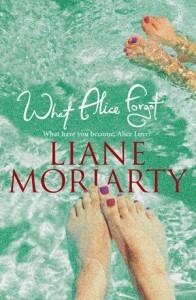 All of her relationships have changed and Alice realizes most of all, SHE has changed. How did she become this Alice? The one with expensive clothes,makeup, hyper organized and constantly busy. Alice learns bits and pieces about what has happened over the years through various other characters but it’s her recently deceased friend Gina, and the memories of her that will provide the most insight–if only she could remember. Alice moved closer to Elisabeth so that their thighs were touching. I loved that bit because ultimately, we always have the choice to move forward, to forgive, to accept and to improve the relationships with those we love. And if it’s worth it to us,we will do the work because no relationship runs smoothly without checking in on them and evaluating the needs of everyone involved. I also scrutinized the idea of how outside influences/perspectives on a relationship may do more harm than good. I finished reading the book with tears in my eyes and a vow to love my family more fiercely than ever…now that it’s my third snow day at home in a row with them, that’s bound to ease up a little,but not much. This is a fun read that’s very reminiscent of the movies Regarding Henry and Overboard…both movies I grew up loving (even though Overboard’s plot is actually super creepy if you think about it for more than a minute). Share the post "Loveable Like Regarding Henry and Overboard"